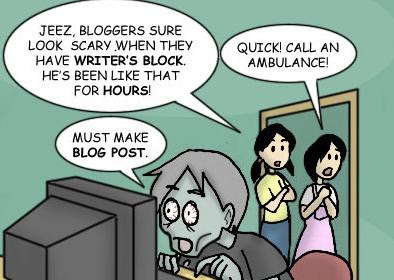 More Than Just Corn: Day 20 - Writer's Block? Um, hi... it's me. It's almost 9:30 pm and I realized I did not post yet today. Now that I sit before you and stare at my screen, I cannot collect my thoughts enough to find any wit. Lame, I know! But others that blog totally know this feeling! If anyone has any content ideas, or something they would like me to write about in the future - DO TELL! This has been a difficult challenge this month for me for National Blog Posting Month (NaBloPoMo). I have 10 days more to go... eeeegads! You are better than I am. I just take a picture every day and say some crap about the child in the picture and make it count as an entry! Try a pre-Thanksgiving post. What you're thankful for? You could post about your upcoming ornament exchange and what to expect. I'll try to think of something more creative. A - even in your weakest blogging moments you crack me up!!! I don't think I could take the challange. I'm lucky if I keep up to date with pics of the kids as that is what I intended to do with this blog!! !